Cryptocurrencies are able to change the way in which the financial world works. Banks know that cryptos are real competitors for established financial institutions nowadays. 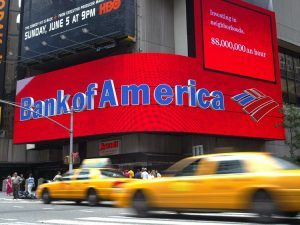 Bank of America has officially commented that it might not be able to compete with cryptocurrencies. This is the first time that an important bank recognizes problems to compete with virtual currencies. According to a report released by the Bank of America, the bank might not be successful in developing or introducing new products and services. As cryptocurrencies and blockchain technology expand, new decentralized ways of financing and moving money from one place to another are taking place, thus, reducing banking profitability. Clearly, the “competitive landscape” is referred to cryptocurrencies and blockchain technology. These new products allow individuals and governments to replace banks and institutions as the only providers of these financial services. This may be the first official declaration of an important bank admitting the difficulties that the industry will face in the next years. The threat is not imminent and is not now, but in the coming years it may be a clear problem for banks profitability. Other financial institutions and governments have explained that cryptocurrencies need a clear regulation. The European Union, France, Germany and Japan have asked for international regulations on virtual currencies due to the fact that state actors alone can’t deal with creating an efficient regulatory framework.